There are many Students software’s which help in improving your communication and proficiency. For Example, If you want to speed up your reading ability then try Acereader, which is one of the best Reading software which helps in increasing your speed of reading. It has been now prominently used by top universities for students in USA and students in UK as training software for fluency and also improving vision. 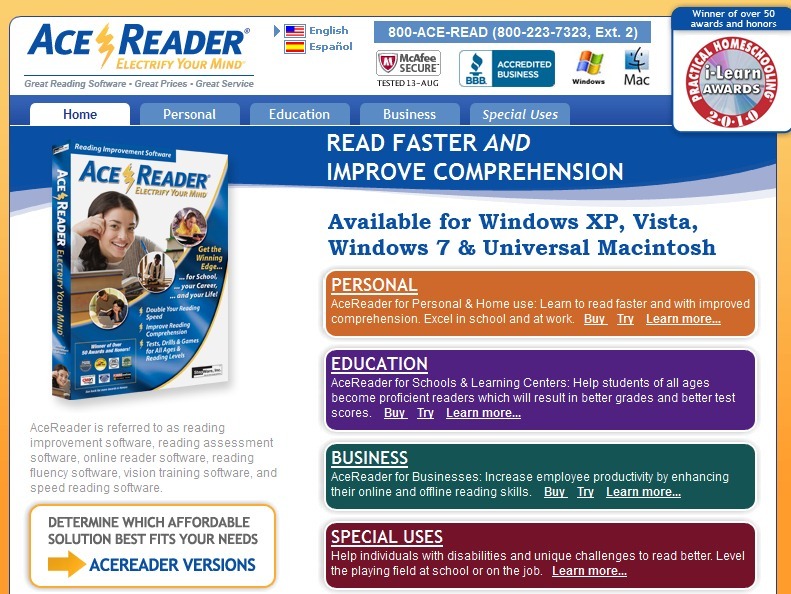 There are different versions of AceReader, for Students, Employees and Educational Institutions. This article briefly explains how this powerful Student Software can help you to read faster online and increase your fluency of reading. Acereader is suitable for all ages and is very easy to use. This speed reading course mainly uses two technologies., one is Rapid Serial Visual presentation (RVSP) where the text scrolls in the center and you need not move your eyes anywhere by which you can improve your concentration on the words. Another one is Tachistoscopic Scroll Presentation (TSP) mode where your eyes are forced move around the words which is like a normal reading but it trains you to read with higher speeds. 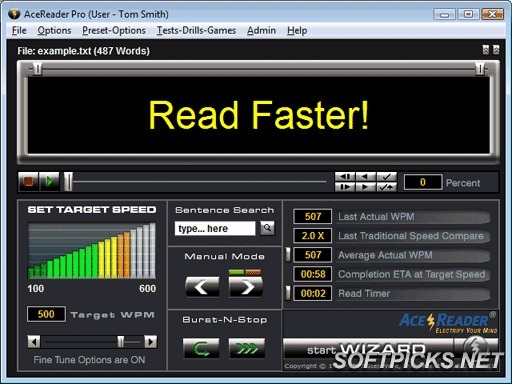 By using this speed reading software you can configure your speed and can track your level of reading at a particular speed by going through various comprehension tests etc., and these are configured to various grade levels like 1-12+. Hence the more you practice the better you can improve learn to speed read and improve your speed of reading capability. You can even use this software to go through various documents that are online ( webpages, email etc., and on your clipboard by importing . By “Burst” and “Sentence Search” features you can read efficiently while online and you can even adjust font size, color, number of words , lines and so on. Acereader speed reading software supports the international ASCII character set (i.e. English, Spanish, German, French, Italian, etc.) and hence you can use your Acereader as foreign language trainer. This Student Software can be useful for the people who are facing with the problems like Asperger’s syndrome, ADD and ADHD disorders , Dyslexia, low vision etc and by this speed reading software they may surely overcome there disabilities and help in increasing there speed and learning ability as this software is designed specially with various useful features by keeping in view of this people. Employees can surely benefit as it helps in improving their reading ability of reading documents , webpages etc and also you can reduce the eye fatique and strain by listening rather than reading like e-mail etc and there by saving more time. One more unique feature is of this speed reading course is that it allows you to pronounce correctly and fluently as you need to pronounce ahead and no chance to regress it . AceReader Video Tutorials which help you to use this speed reading course and best How to speed read guide for students and employees. There are various eye excercise games for students who enjoy while they improve their speed. Likely , there are various Acereader versions which can be chosen either for personal use, Educational Institutions or business organizations . And you can even try free trial to check your speed and all these versions are available at affordable price. Visit AceReader Website to get your AceReader Version today.